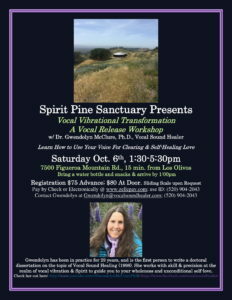 At this incredible Figueroa Mountain location, come release your voice and clear your mind, body & spirit! Gwendolyn will guide you to make vocal sounds to clear and heal your Being, and bring in to your field the frequency of unconditional love. Gwendolyn’s approach is very gentle, yet very powerfully effective. She meets people exactly where they are and guides them with love into the depths of their Being for the next steps on their spirit’s journey in this lifetime. At this workshop you listen to yourself inside, and vocalize what needs to be heard, and you clear out what is no longer needed. REGISTER In Advance: $75 https://www.zellepay.com; use Zellepay ID: (520) 904-2043: “Wendy McClure”; OR pay by check and send to Dr. Gwendolyn McClure 133 E. De La Guerra St. #228 Santa Barbara, CA 93101; OR AT DOOR PRICE: $85 Check, Cash, Zellepay or Venmo. At this afternoon retreat you will experience both passive and active vocal sound healing. Passive vocal sound healing is when you experience Gwendolyn singing and making vocal sounds to bring in the frequencies of pure love and light. Active vocal sound healing is when you soften your throat, connect your throat to your heart, and activate your voice to become a tool for clearing & strengthening your spirit and body. You will be guided in how to use your voice to clear pain and lower frequency emotions, and claim yourself as the source of unconditional love. More Bio Details: Through Heart, Intuition, and Mind, Gwendolyn shares her Songs and Vocal Sounds, transmitting the vibrational frequency of unconditional love to awaken and inspire people to commit to and take steps along their healing journey in this body in this lifetime! She created techniques to guide people to “Activate” their Voice as a Self-Healing Tool. Gwendolyn wrote her doctoral dissertation on her work: “A Cross-Cultural Interdisciplinary Study of the Healing Power of Singing & Vocal Sounding” (Pacifica 1998), and shares her Gifts in the form of Concerts, Workshops & Private sessions in and outside the U.S. Gwendolyn has presented in CA, AZ, MI, NY, OR, WA, OH, NM, NV, ID, & Mexico!